Leonie Hill. 128 units. Completed: Around 1995. 25-storey tower. Type A: Upper penthouse 25th storey - roof garden going into family room. Master bedroom and bedroom 2. Type A: Lower penthouse 24th storey - Bedroom 3, study, lounge, living and dining area, guest room and terrace. Type B: Upper penthouse 25th storey - roof garden and 3 bedrooms plus family room. Type B: Lower penthouse 24th storey - Guest room, lounge, living and dining area. Type C: Upper penthouse 25th storey - bedrooms plus family room. Type C: Lower penthouse 24th storey - Guest room, lounge, living and dining area. Type D: Upper penthouse 25th storey - 2 bedrooms plus family room. bedrooms, family room, study room, living and dining area. Type L: 1st storey. 2-bedroom. Type P: 2nd - 23rd storey. 3 bedrooms with attached baths and 1 study room, family room, living and dining area. The dining area is located to one far end, separate from living area and family area which is nearer to the main entrance. This L-shaped floor layout appeals to many Caucasians. 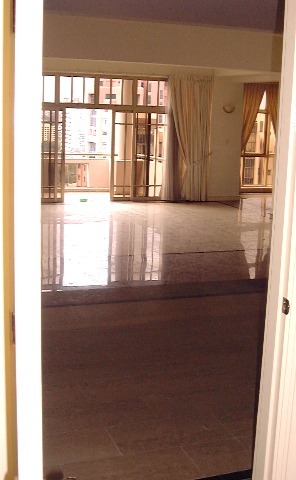 Entry foyer (foreground) leads to a spacious living area and big balcony at far back. The dining area on far right. Type M: Upper maisonette 3 bedrooms and family area on upper level and study room, living and dining areas on lower levels. Type S & Type T: 2nd-19th storey. 3 bedrooms and study and family area. 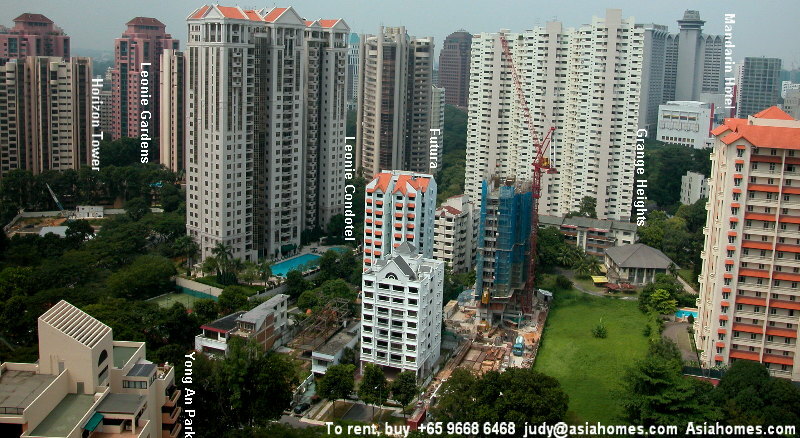 Type S1 & T1 on 20th, 21st, 22nd and 23rd storeys. 3 bedrooms and study and family area. Many units have been remodeled as at September 1, 2000. Bedrooms - carpeted but there are parquet-floored ones. Built-in wardrobes, kitchen cabinet, air conditioning in kitchen and maid's room (window unit). Ducted air conditioning with remote controls at room level. The balcony has a solid lower wall, without railings unlike some condos, so that children cannot climb but then views are blocked from the dining or living area. 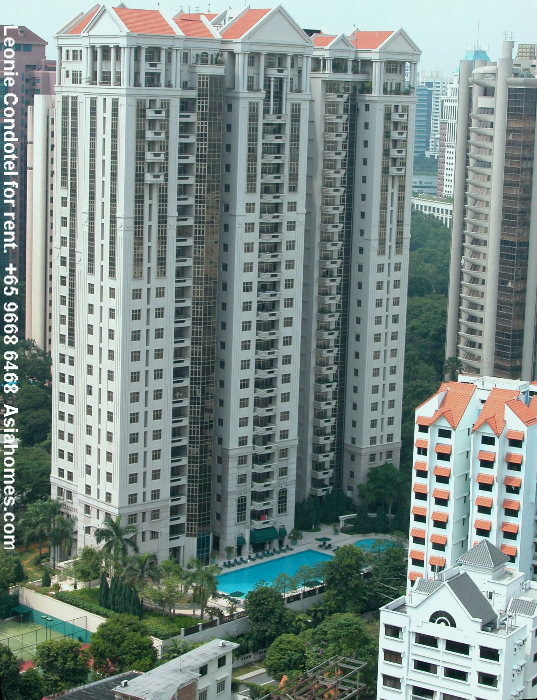 squash courts x 2, gym, fitness area, big billiard table room, Singapore Cable Vision points, children's playroom, reading room. Lift access cards to apartments. Great location and great facilities sum up the great demand for Leonie Condotel. 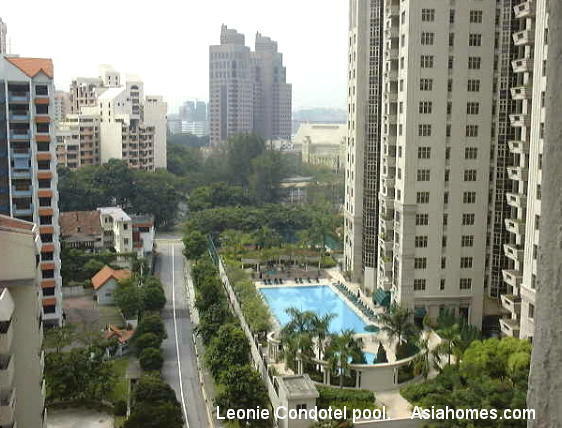 Leonie Condotel as viewed from the Great World Serviced apartment pool, is within walking distance to the Great World City shopping mall and Cineplex. 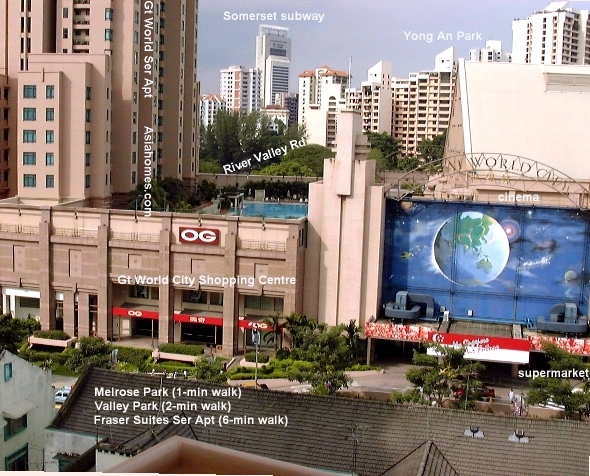 8-minute walk to Orchard Road and 2 subways (Orchard & Somerset) and many shopping malls and supermarkets in Orchard Road's malls besides the Great World City Shopping Centre. Though not new, it is extremely popular with Americans and other nationalities as it is close to 2 subways and Orchard Road. It has an impressive visitor's foyer of polished Italian granite which is important for expats who need to impress clients. It has a unique Graeco-Roman architecture. A squarish-layout for the living and dining areas and the bedrooms make it easier to arrange furniture. Outside the CBD (Central Business District) Restricted Zone's toll gate and therefore no need to pay the vehicle electronic tolls per entry into the CBD. Leonie Condotel. Big balcony, swimming pool, gym and great location. Big balcony from the living room for a table and 4 chairs has always been an asset to any serviced apartment or condo. Some floor plans have a smaller 50 sq. ft balcony off the master bedroom. Powder room present. Kitchen is air conditioned. From the main door, an entry foyer with steps leading to the living area and then the separate dining area on one side. Bedrooms are at the sides of the entry foyer. Maid's room available, with air conditioning. 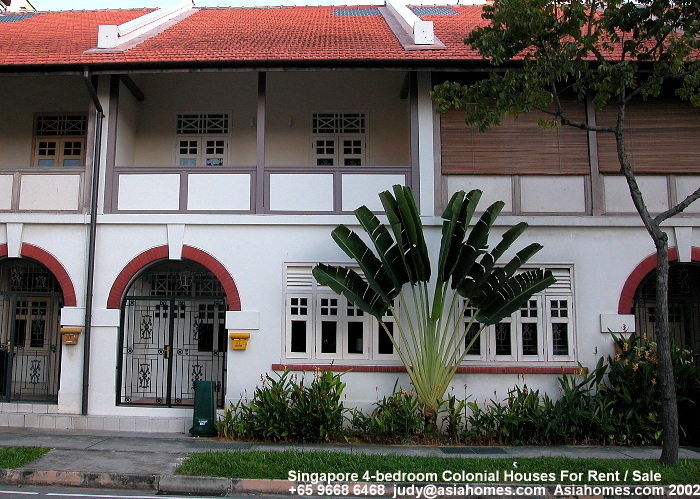 Most serviced apartments in Singapore don't have maid's room. Medium density condo with large Caucasian population and many children. Air-conditioned kitchen. However, the air conditioner is a window unit type, not the ductless type seen in new luxurious condos like Grange 80, Nassim Woods and The Paterson Edge. Many taxis plying along Leonie Hill. On-site management is important for tenants. A big billiard room, uncommon in any condo. Except for top floors, an unobstructed view from the living area is rarely available as neighbours are high rise condos. You may see some ships and sea from the top floors. Advert by Realtor: Units available for rent. Should you be punctual during house viewing? "Does Ms Tan get a black mark for being late?" queried Mrs S as she, her husband and another realtor had been waiting over 20 minutes in the hotel for another associate to arrive. Ms X was the realtor in charge and the meeting was to be at 10 a.m for a 2nd viewing of Nassim Woods. She was asked to be punctual as this 2nd viewing would likely to result in a closing of a $10,000 rental apartment. The stakes were much higher as this is worth 5 clientele with $2,000 rental budget for the same time and efforts expended. Many novice realtors do not appreciate the importance of being punctual. They usually have a late Friday night out, being single. They may save transport costs by taking buses or subway to the hotel instead of a cab or do not take into account possible traffic jams downtown. Punctuality gives good impressions to Caucasians. One aspect of the culture of most Caucasians, especially in top management is to be punctual at appointments. Punctuality shows professionalism and seriousness in your work and you do get referrals. If you don't get referrals, at least you don't leave a bad impression as top Caucasian managers usually have a hectic schedule of meetings and value punctuality more than the average Singaporean. Best is to be 15 minutes earlier as in this case, the Caucasian couple came down to the lobby to meet the realtors at 10 am sharp. In this case, it was fortunate that there was a closing on Nassim Woods, otherwise there would be no bread on the table for Asia USA associates. By being late, the Caucasian couple might have to cancel the 2nd viewing. There would then be a delay in decision making as the couple had to go abroad. On returning, other realtors from outside companies might take over, such is the competitive nature of this business.